The theme auto detects the default Google AdSense and the custom banners that respect the structure provided in the documentation and makes them responsive automatically. Each ad spot has one box where you can insert the ad code. To manage the header ad, go to Newspaper > Theme Panel > Ads and open the Header ad section. 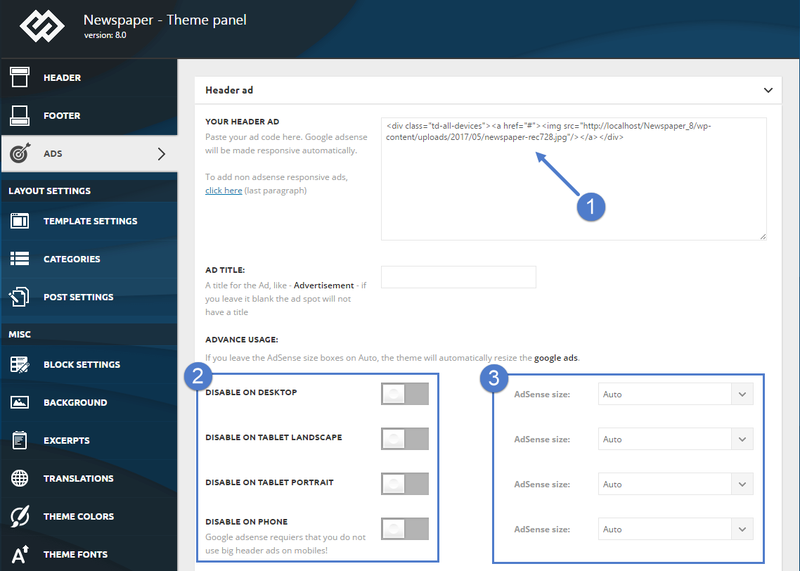 Just add your code and save the settings; if you use Google AdSense, the theme will automatically make it work on all devices. Your ad will be displayed in the header section of the site. To set up your ad, go to Newspaper > Theme Panel > Ads, and open the Header ad section. [shortcodes] – The spot will run do_shortcode() on the ad. Using shortcodes you can include adRotate ads into that spot.